The scorecard will be prepared by a qualified home energy auditor authorized by the state and must be submitted to the Department of Energy Resources (DOER). Scorecards to be produced following Mass Save® energy assessments, RESNET HERS ratings and other energy assessments designated by DOER, such as the U.S. DOE Home Energy Score. Municipal lighting plants and their cooperatives can opt into the program. Energy performance ratings to be disclosed when a home is publicly listed for sale and scorecards to be disclosed before the execution of a purchase and sale agreement. 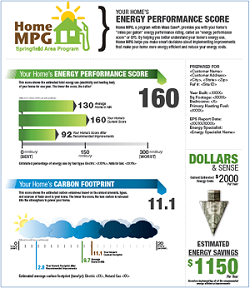 This is an example of an energy card showing a high score of 160 and what can be possible if the homeowner makes energy improvements to their home. Also shown is the homes' high carbon footprint score compared to typical homes and what the home would rate if recommended improvements are made. The lower the carbon footprint score the less carbon released by you into the atmosphere. The scorecard provides homeowners and buyers with the "Miles Per Gallon" energy performance rating or energy performance score. This will help potential buyers to make informed decisions on what to offer for the price of a home. Homes with high energy performance ratings will cost more to operate and will trigger lower offers from buyers. Homes with high carbon footprint ratings will let buyers know the home is not good for the environment. In my education classes I have been predicting that HERS ratings scores would eventually be a prerequisite to selling a home. I just didn't expect my home state to be the first to make it a reality. I predict this will be a huge change to the home improvement and remodeling market in Massachusetts. Many homeowners will be challenged with the prospects of lowering their carbon footprint by improving the energy efficiency of their home or face the reality of lower home value and sales price. I am thinking that high performance homes will be perceived as more valuable in comparison to older less efficient homes. In the past 10 years as the cost to build a home to today's code have skyrocketed, builders have been squeezed. In my classes, builders tell me most consumers want energy efficient homes but they do not want to pay for it. In addition, most banks use comps from older homes when assessing the value of high performance homes. The scorecard requirement will likely lead to more accurate value assessments for older homes and help differentiate high performance homes. Builders will likely fare better getting more money for their homes. What does this mean for Realtors? Less commission on older homes and more commission on high performance homes. Also realtors will need to improve their knowledge on how to sell high performance homes and advise owners of older homes. What will this do for remodelers and trades? What will this mean for homeowners of older homes? Improve energy efficiency, lower your carbon footprint, standout as more valuable compared to unimproved homes and receive a fair selling price. Or don't do anything and watch the value and price of your home go down!